Before I start today's post I would like to preface it by saying why I write this online diary of sorts. Well, there's two reasons for that. The first reason is to continue to tell my families story. This blog started on day one of our cancer journey and our story is still being written. There are many readers, some of whom I've never met, that have faithfully prayed for my family for the last three and a half years. I continue to write so they can see our story unfold and even see their prayers in affect. The second reason is to show others a new way to see things. Some readers have never walked through cancer and this blog shows them the ups and downs of the journey. Many people have not walked through grief as I have and I hope I am showing them honesty and vulnerability in that process. I also hope my words can help you understand what it's like so you may help others walking through this process because if you know someone walking through grief they need you. More than you know. I hesitated to write this post and went back and forth on it for many reasons. The biggest reason being I was afraid some of the people in my life may think I am referring to them personally in this post. While I speak from personal experience this post is definitely not meant to try to shame people or make them feel bad. The people who are the closest to me know my heart and know what I write comes from an honest place. So why the title-when the trucks go home? I've referred many times on this blog to the May 20th tornado that devastated my home state. The tornado was literally only a few miles away from us and it had a great emotional affect on both my husband and I. Every morning on my drive to work I pass right through where some of the heaviest damage was. Right after it happened that also happened to be where the media center was. 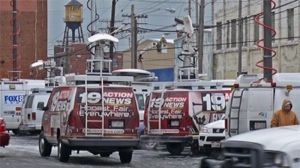 Every single day for many weeks I would see news trucks from CNN, MSNBC, Fox News, NBC, ABC and even the BBC. The coverage of this disaster was non stop and every news organization was here to cover the latest story. The Today Show crew was here talking to survivors, Brian Williams was here doing a special and I nearly ran right into Anderson Cooper while he was out conducting interviews in the areas we were cleaning. Day after day it was an endless loop but there was an interesting change after about a week. One by one the trucks started to disappear and within a month the media center was completely empty. Right after the tornado the donation centers were turning people away because people were giving too much and they had more than enough contribution items (I love my state and the people in it). I remember walking amongst the wreckage one evening and we couldn't even find anyone to help. Everyone had been inundated with items and everything they needed. Now that we are 5 months out, all of the massive distribution centers are closed down. And yet, as I look over the landscape that the tornado carved through, very few people have actually even started to rebuild. Most of the lots are barren and empty waiting for a home to be resurrected once again. There's just a process to go through before most people can make that happen and it certainly doesn't happen over night. I wonder how many people were so busy cleaning up the wreckage, that was once their beloved home, only to look up one day and wonder where have all the trucks gone? Where is all the support they had in the month of May? Because it is now October, the warmth of May has passed and the cold of winter is ahead, and yet there is no one to be seen. They stand in the middle of an empty lot, where a home filled with love once stood, and they find themselves very alone. This is what it feels like when you walk through grief. At the beginning you are surrounded with people loving on you and caring for you almost to the point you have to turn them away. Yet slowly one by one they get to return to their normal lives and they return to the business of those lives. You don't get that luxury. You don't have a home to even return to and while you are in the midst of trying to rebuild you look up one day and wonder where did everyone go? It's a lonely, lonely feeling. The most consistency I have had came from very unlikely sources. I have a woman who wasn't even a close, close friend before all of this (she's a dear friend now) who made a commitment to me to jog in my neighborhood every Monday and pray for my family for an entire year. Since May she has never missed a week. Never. Even if it rains she will just come sit in her car at my house and pray. This woman has 4 children and a busy life of her own but that never stops her. She committed to do it and she has faithfully done what she said she would do. Our precious next door neighbors have mowed our lawn the entire summer and brought us dinner once a week. Consistently. Without fail. One week they did miss a mowing only to come and tell me "well he had to have a stint put in this week-but he'll definitely be back to mow next week!" I tried to convince them I could just hire someone but they wouldn't have it. These individuals have been a glimmer in the midst of my wreckage and they are literally Gods hands and feet. But there have also been others who make promises, say they will invade your life and be there until you push them away. I have found the ones who were the most vocal are many of the ones who I never or rarely hear from. People are drawn to others who are walking through tragedy but only briefly, they have their lives to attend to and that's truly what's important to them. The hard part is that on top of everything else I am grieving, I have really had to go through a mourning process of people who let me down. People who said they would be there and haven't. That has been an unexpected part of my grieving process and just another one of the many intricate layers I have had to weave through. It's important to note there is no time frame for how long it takes one to recover from tragedy. For some it might take one year and for others it might take many years. It's also important to note those going through tragedy don't need you to have all the answers. They don't need for you to try to fix their problems. They need for you to be there if you said you would. They need you to not disappear because you're too busy and most of all they need you to love on them like crazy. I missed a phone call from my old college room-mate the other day who is a missionary in India. As I listened to her voice, which I hadn't heard in years, my eyes were filling with tears. I couldn't believe she had called me, from half a world away, just to tell me that she loved me and was thinking of me. She and I didn't sit and have a 4 hour conversation about life and all it's meaning and she didn't come to my house and take me out for a night on the town. She didn't have to. What she did was make an effort, which from how far away she is it is definitely an effort, to let me know that she loved me, cared about me and was praying for me. That was enough. In the 3 months since losing my husband most of the trucks have gone home. But I am so thankful for the tiny few who have not left me, but who are getting their hands dirty helping me clean up the wreckage of my life once again. Day by day. Piece by piece. For those people, I am so very thankful.